If you are considering buying a trampoline as a gift , you may want to think about its shape before you buy it. There are trampolines in a variety of shapes and sizes. Each shape will allow the jumper to do different things. The round trampolines are great for some things, but if you want high bounces and plenty of play area for yourself or your kids, the rectangle trampoline will be more impressive for you. Rectangular trampoline prices tend to be higher but depending on your use it could be worth it. A round trampoline like the most popular Skywalker 15′ Trampoline, is designed in a way that allows each spring to react to a jump all at one time. This works to provide an even bounce that is controlled. This also ensures that jumpers are pushed more toward the center of the trampoline naturally because the area in the middle is the softest area of the trampoline. 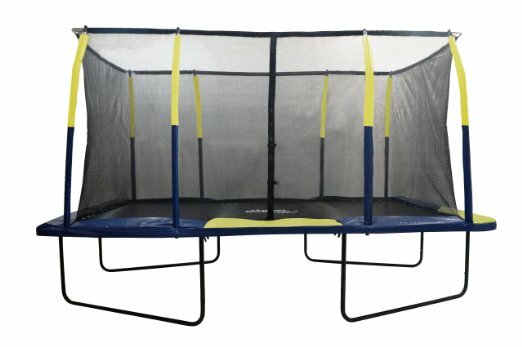 With a rectangle trampoline, the bounce is not controlled. It is even from one end to the other. Each spring reacts differently to the bounce and at various times. This means the bouncer is free to jump on any part of the trampoline and it guarantees the ultimate bounce regardless of what area of the trampoline they are on. The freedom of bounce that the rectangle trampolines gives is ideal for a variety of sports,trampoline exercises and recreational uses. However, it may also mean that you should consider a rectangle trampoline with enclosures to keep children from accidentally bouncing off of it, especially if they are doing tricks. Due to the even bounces that a rectangle trampoline provides, these trampolines are the only ones you will find in a competition. They are used in gymnastics and even the Olympic games use them. They are popular for families who have children that participate in tumbling, gymnastics, and cheer leading. Also, they are great for doing tricks on because they will not force the jumper into the center of the mat. When it comes to a rectangular trampoline, the way it is built matters a lot. A round trampoline is able to have supports all the way around it. The circle is a kind of support in itself. When you find a rectangle trampoline for sale you will see that there less support on the long sides of the rectangle. This means the trampoline itself should be made of higher quality metals. You will also have a choice on how it is designed. Some trampolines that are rectangular in shape, like the Skywalker rectangle trampoline, have four legs that run diagonally under each corner. Others will have only two legs that run from side to side on each end. If the rectangle has only a leg at each end, you need to look closely to see if it is reinforced by braces that may run from the bottom of the leg to the edge of the trampoline. If it does not, it may have a double metal tube connecting the legs to one another along the longest edges. A lot of people also feel that a safety net is a must have because of the fact that rectangle mats are great for tricks. Because it is used for jump routines, flips, and other tricks, it is easy to lose sight of where you are as a jumper. You would not want the children you love to fall off of the trampoline while doing their routines. Therefore, if you feel the trampoline will be used for tricks or by more than one person at a time, a net is definitely something you want to think about. This trampoline provides stability and safety for jumpers. It is made with galvanized steel and reinforced T-sockets. This will stabilize the trampoline and prevent it from twisting over time. 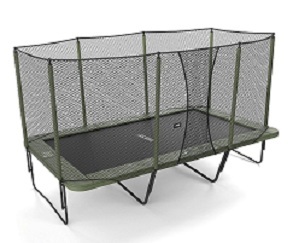 The net enclosure is made of polyethylene and utilizes button holes to attach it to the trampoline mat at each V-ring to ensure that even young jumpers will not slip through the bottom of the net and also attaches at the top of poles around the rectangle. It has an extra-large pad that is 1inch thick and secured by reinforced stretch bands to protect the jumper from the springs. Each part of it is made to resist UV rays which will protect your trampoline from bad weather and extreme conditions. The negative reviews are generally based on the shipping and packaging of the trampoline. See more owners reviews here. This is a newer trampoline and made by a company in Finland. The trampoline measures 16ft x 9ft which gives jumpers a lot of surface to jump on. Compared to the other rectangular trampoline prices this is going to be the most expensive but we think it’s worth it depending on your needs. The frame is made from heavy duty galvanized steel and comes with a 5 year warranty. The total weight is around 500 lbs. This tells you just how rigid this trampoline is and that it is built to last. 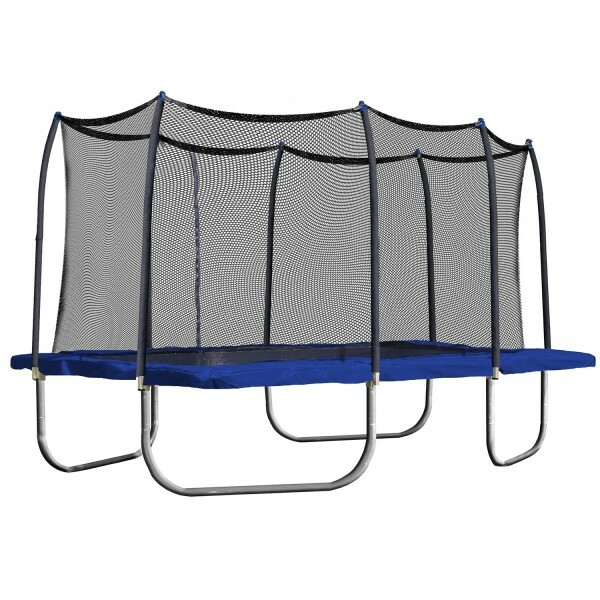 It also has no weight limit for single jumpers so this is a great trampoline for larger adults. If you’re looking for a durable trampoline that can be left outside all year around (recommend anchoring it to the ground) this is your best option! See more owner reviews here. This trampoline is made with patented stagebounce technology that allows 50% of the springs to engage instantly. This technology is supposed to reduce the chance of being injury on the jumping surface. The frame is made of cold rolled steel and finished with a black poweder coat. It also comes with a 10 year warranty which is one of longest in the business. Mat has a UV coating and is made fro 10 rows of stitching. The single user weight limit is 225 lbs but the real world tested combined weight limit is around 800 lbs. 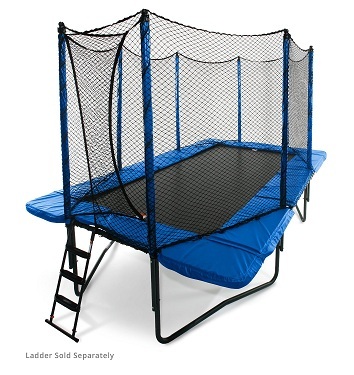 JumpSport allows offers a variety of accessories to go along with this trampoline. See more owner reviews here. The best thing about this trampoline is the fact that it is easy to assemble because no hardware is needed and it has a net that is secured at the top and the bottom. With a net that has Top Flex Pole Enclosures you will know that the net will not sag over time. It has a high quality mat that features 8 row stitching. This helps to give it durability for many years to come. It has 86 springs which are covered by a UV resistant pad. The overall opinion of most Amazon users is that it is sturdy, durable, and a lot of fun. See more owner reviews here.